New, used and rebuilt Rockwell differential axle shafts ready to ship Worldwide! Including Rockwell truck and equipment differentials from tandem drive axles, front steer axle to single axle differentials including new, used and rebuilt differential axle shafts ready to ship Worldwide! We also buy and sell Rockwell differentials and Rockwell differential cores in need of rebuilding. We also purchase parts for inventory. We stock any Rockwell Differential parts your shop may need to rebuild units such as gearing, cases, seals, gaskets and bearing kits; great for on highway, off highway, industrial, agricultural, construction, mining and logging. We are your heavy duty truck parts and equipment super store. If you need 10 items to rebuild your unit, make one call because we stock them all. SAME DAY SHIPPING. Pro Gear has been delivering quality for over 20 years. 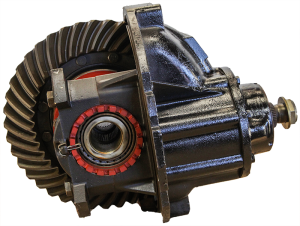 In addition to our large inventory of ready to ship exchange Rebuilt Rockwell Differentials, we also offer a Premier rebuilding service of your Differential axle. We will be happy to help you locate the Rockwell differential you need as well as free expert advice on service and repair. Contact us today to speak with a differential expert. For line haul and city delivery applications, ArvinMeritor offers a full range of tandem drive axles from 34,000 lbs. to 50,000 lbs. GAWR. Meritor tandem axles are built to handle the heavy loads while helping to reduce maintenance and operating costs. ArvinMeritor offers the widest selection of axle ratios with the availability of fast ratios for better fuel economy. And, when tag tandems are required for load distribution, ArvinMeritor can custom-fit virtually any application. The latest ArvinMeritor design the MT-40-143MA-N was designed to virtually eliminate vibration throughout the entire drivetrain. These axles were engineered with a rear carrier featuring Amboid gear designs providing above-centerline positioning of the drive pinion. This positioning significantly reduces inter-axle driveline angularity which, in turn, minimizes driveline vibration for construction and refuse applications, ArvinMeritor offers a full range of single-reduction tandem drive axles from 34,000 lbs. to 50,000 lbs.